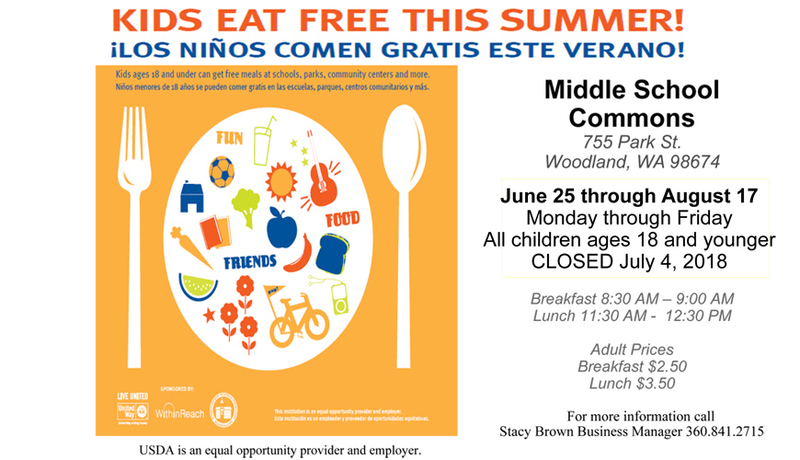 Children 18 years and younger can receive free meals at Woodland Middle School throughout the summer thanks to the Simplified Summer Food Program for Children. Breakfast: 8:30 a.m. to 9:00 a.m. Adult meals are available: $2.50 for breakfast and $3.50 for lunch. Please note: The program is closed on July 4, 2018. For more information, call Stacy Brown, Woodland Public Schools Business Manager, at (360) 841-2715.